Let us help you design your next bathroom design. Check out our gallery and see our work. Each piece is uniquely designed for your space. This towel rack is made from wine and whiskey barrels. Fits hand towels or bottles. Makes for great bathroom décor. 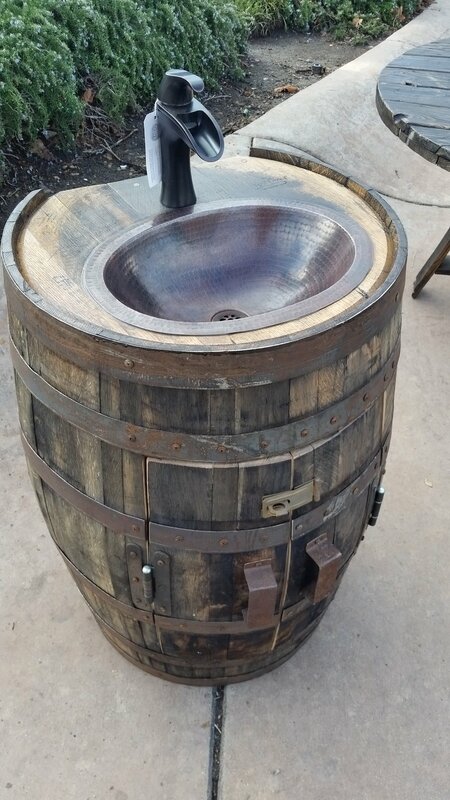 Made from wine and whiskey barrels staves and rings. Custom made bathroom cabinet that really sets your style apart. Each cabinet is made to custom fit your space. Sink and hardware is not included. Each barrel is unique with its own characteristics. All pieces vary in shade and patina. All pieces are handmade and carefully crafted to bring out the natural beauty of the wood.